GetLinked® Software Forum • View topic - Does GETLinked Software ARLink module import Summary or Detail Invoice data from Micros Guest Services Solution (GSS)? Post subject: Does GETLinked Software ARLink module import Summary or Detail Invoice data from Micros Guest Services Solution (GSS)? 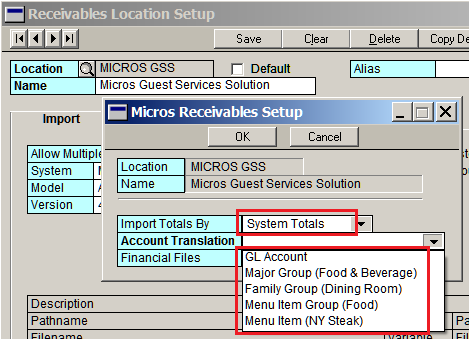 GETLinked Software Accounts Receivable (ARLink) module imports "Summary" as well as some detail data from Micros Guest Service Solution (GSS) module. 1. GETLinked Software can "Import Totals By: System Totals or Revenue Centers. 2. GETLinked Software imports "Account Translation" by: GL Account, Major Group, Family Group, Menu Item Group or Menu Item. The detail on the "Statement" in your accounting system is "SUMMARY" ONLY! This feature is relevant to your accounting system. The recommendation for wanting every detail item printed with the Accounts Receivable Statement is to re-print every detail invoice ("ticket") with items from your Point of Sale History. Attach these invoices to the statement. Does GETLinked Software ARLink module import Summary or Detail Invoice data?